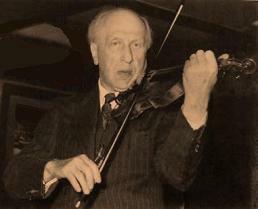 Oskar Back was a Hungarian (some would say Dutch) violinist and teacher born (in Vienna) on June 9, 1879, (Brahms was 46 years old.) He first began lessons with his father then continued with Jacob Grun (teacher of Oskar Morini, Erica Morini's father.) At age 17 he travelled to Belgium. There, at the Brussels Conservatory, his main teacher was Eugene Ysaye. Although his achievements as a violin virtuoso earned him the respect of many outstanding musicians, he eventually became an important violin pedagogue because, just as Ivan Galamian did, Back suffered from debilitating stage fright. He taught for many years at the Royal Conservatory in The Hague. Among his famous students are Theo Olof (concertmaster of the Royal Concertgebouw Orchestra for many years), Herman Krebbers (teacher of conductor Andre Rieu), Davina Van Wely (teacher of violinist-conductor Jaap Van Zweden – the youngest concertmaster in the history of the Concertgebouw), and Alma Moodie (Carl Flesch’s favorite pupil.) A Stradivarius violin built in 1666 is known as the Back Stradivarius, even though he only owned it for one year (1957), and a well-known violin competition in Amsterdam, begun in 1967, is named after him – this year, it runs from April 22 to April 28. Back died on January 3, 1963, after an unsuccessful surgery (just as Camilla Urso also died), at age 83. As far as I know, he never recorded anything, although that seems very unlikely.